Ukraine will pay $245 per thousand cubic meters for the gas it will get through reverse flow from Europe as the country diversifies its natural gas suppliers away from Russia, President Petro Poroshenko has said. Ukraine has significantly reduced its energy dependence on Russia, and will buy Russian gas through reverse flows from Europe at $245 per 1,000 cubic meters, Ukrainian President Petro Poroshenko said in a TV interview Monday. "We have lived through the winter; we bought only 2 billion cubic meters of gas with the last purchase at a price of less than $300 per 1,000 cubic meter. As a result, it all came down to the Russian Federation having had to apply for a pumping volume increase of 68 percent, which crashed the gas market. And today we will buy gas for $245 under reverse deliveries," Poroshenko said. Ukraine has increased the amount of gas collecting in its underground storage facilities to 23 million cubic meters per day compared with 8 million cubic meters in February, according to the data provided by the GSE association on Tuesday. Currently the country is accepting 10 million cubic meters of Russian gas daily at a price of $329 per 1,000 cubic meters. 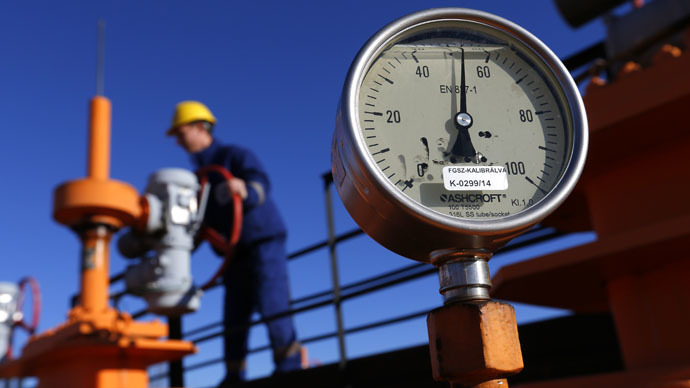 Ukraine claims it pays 15 percent more for Russian gas than Europe. Ukraine currently receives reverse deliveries of natural gas from Slovakia, Hungary and Poland. Gas supplies from Hungary have been reduced by Ukraine and stand at 715,000 cubic meters a day from March 7, which is almost 5 times lower than in February, according to reports from the TASS news agency. Capacity from Slovakia remains at 37.7 million cubic meters a day. Poland can deliver up to 717, 000 cubic meters a day compared with 840,000 cubic meters in February. Last week Ukraine imported 330 million of cubic meters of natural gas from Europe, and 81 million cubic meters from Russia. Russia halted gas supplies to Ukraine last June over the country's debt that exceeded $5 billion. Ukraine then started receiving gas in reverse flows from a number of neighboring European countries. On December 9, Russia resumed gas sales to Kiev under the so-called winter package, which required Ukraine to repay $3.1 billion of its debt and pay for future supplies in advance. Ukraine has accused Russia of breaking the contract and delivering less gas than required, while Moscow said it was complying with the contract and insisted on advance payment from Kiev. Ukraine’s Naftogaz has recently prepaid for 63.3 million cubic meters of gas. The prepayment will last till March 15, Gazprom’s spokesman Sergey Kupriyanov told journalists on Tuesday. President Poroshenko has acknowledged Ukrainian industry was almost in ruins, saying that 25 percent of the country’s manufacturing facilities had come to a standstill and 10 percent of the country's industrial potential had been physically destroyed during the fighting on the southeast of Ukraine. Defense spending accounts for about $4 billion at the current exchange rate (90 billion hryvnia) and Ukraine would not see any investment while the war’s going on, Poroshenko said. The leader of the pro-Russian Ukrainian Choice organization Viktor Medvedchuk says on its website that Ukraine’s strategic resources are declining rapidly. The country’s international reserves has fallen more than 12.4 percent to just $5.625 billion as of March 1, 2015, according to the data from National Bank of Ukraine. Medvedchuk doesn’t share the government’s optimistic hopes about the new IMF bailout package, which is due to be approved on March 11, 2015. Last week the Ukrainian parliament drastically revised the country’s budget in compliance with the austerity terms associated with the IMF’s $17.5 billion aid package. The economy of Ukraine is currently in a state of collapse and foreign borrowing would not improve the situation, Medvedchuk says, adding that the IMF money would only be enough to pay off the country’s old debt.